Thomas Wolsey, Archbishop of York, Chief Minister and favourite of Henry VIII, took over the site of Hampton Court Palace in 1514. It had previously been a property of the Order of St John of Jerusalem. Over the following seven years, Wolsey spent lavishly (200,000 gold crowns) to build the finest palace in England at Hampton Court. In building his palace, Wolsey was attempting to create a Renaissance cardinal's palace of a rectilinear symmetrical plan with grand apartments on a raised piano nobile, all rendered with classical detailing. Wolsey was only to enjoy his palace for a few years. In 1528, knowing that his enemies and the King were engineering his downfall, he passed the palace to the King as a gift. Wolsey died two years later in 1530. Within six months of coming into ownership, the King began his own rebuilding and expansion. Henry VIII's court consisted of over one thousand people, while the King owned over sixty houses and palaces. Few of these were large enough to hold the assembled court, and thus one of the first of the King's building works (in order to transform Hampton Court to a principal residence) was to build the vast kitchens. These were quadrupled in size in 1529. The architecture of King Henry's new palace followed the design precedent set by Wolsey: perpendicular Gothic-inspired Tudor with restrained Renaissance ornament. Between 1532 and 1535 Henry added the Great Hall (the last medieval great hall built for the English monarchy) and the Royal Tennis Court. The Great Hall has a carved hammer-beam roof. During Tudor times, this was the most important room of the palace; here, the King would dine in state seated at a table upon a raised dais. The hall took five years to complete; so impatient was the King for completion that the masons were compelled to work throughout the night by candlelight. The gatehouse to the second, inner court was adorned in 1540 with the Hampton Court astronomical clock, an early example of a pre-Copernican astronomical clock. Still functioning, the clock shows the time of day, the phases of the moon, the month, the quarter of the year, the date, the sun and star sign, and high water at London Bridge. The latter information was of great importance to those visiting this Thames-side palace from London, as the preferred method of transport at the time was by barge, and at low water London Bridge created dangerous rapids. This gatehouse is also known today as Anne Boleyn's gate, after Henry's second wife. Work was still underway on Anne Boleyn's apartments above the gate when the King, who had become tired of her, had her executed. During the Tudor period, the palace was the scene of many historic events. In 1537, the King's much desired male heir, the future Edward VI, was born at the palace and the child's mother, Jane Seymour, died there two weeks later. Four years afterwards, whilst attending Mass in the palace's chapel, the King was informed of his fifth wife's adultery. The Queen, Catherine Howard, was then confined to her room for a few days before being sent to Syon House and then on to the Tower of London. Legend claims she briefly escaped her guards and ran through The Haunted Gallery to beg Henry for her life but she was recaptured. It was to Hampton Court that Queen Mary I (Henry's elder daughter) retreated with King Philip to spend her honeymoon, after their wedding at Winchester. Mary chose Hampton Court as the place for the birth of her first child, which turned out to be the first of two phantom pregnancies. Mary had initially wanted to give birth at Windsor Castle as it was a more secure location, and she was still fearful of rebellion. But Hampton Court was considerably larger, and could accommodate the entire court and more besides. Mary stayed at the Palace awaiting the birth of the "child" for over five months, and only left because of the inhabitable state of the court being kept in the one location for so long (sanitation was almost non-existent and the smell was over-powering, after which her court departed for the much smaller palace of Oatlands. Mary was succeeded by her half-sister, Elizabeth I, and it was Elizabeth who had the eastern kitchen built; today, this is the palace's public tea room. On the death of Elizabeth I in 1603, the Tudor period came to an end. The Queen was succeeded by her first cousin-twice-removed, the Scottish King, James VI, who became known in England as James I of the House of Stuart. In 1604, the palace was the site of King James' meeting with representatives of the English Puritans, known as the Hampton Court Conference; while agreement with the Puritans was not reached, the meeting led to James's commissioning of the King James Version of the Bible. King James was succeeded in 1625 by his son, the ill-fated Charles I. Hampton Court was to become both his palace and his prison. It was also the setting for his honeymoon with his fifteen-year-old bride, Henrietta Maria in 1625. Following King Charles' execution in 1649, the palace became the property of the Commonwealth presided over by Oliver Cromwell. After the Restoration, King Charles II and his successor James II visited Hampton Court but largely preferred to reside elsewhere. By current French court standards Hampton Court now appeared old-fashioned. It was in 1689, shortly after Louis XIV's court had moved permanently to Versailles, that the palace's antiquated state was addressed. England had two new joint monarchs, William of Orange and his wife, the daughter of James II, Queen Mary II. 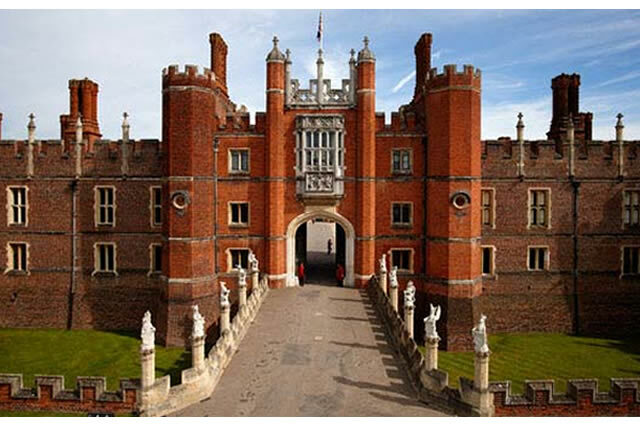 Within months of their accession they embarked on a massive rebuilding project at Hampton Court. The intention was to demolish the Tudor palace a section at a time, while replacing it with a huge modern palace in the Baroque style retaining only Henry VIII's Great Hall. The country's most eminent architect, Sir Christopher Wren, was called upon to draw the plans, while the master of works was to be William Talman. The plan was for a vast palace constructed around two courtyards at right angles to each other. During this work, half the Tudor palace was replaced and Henry VIII's state rooms and private apartments were both lost; the new wings around the Fountain Court contained new state apartments and private rooms, one set for the King and one for the Queen. Each suite of state rooms was accessed by a state staircase. The royal suites were of completely equal value in order to reflect William and Mary's unique status as joint sovereigns. Due to uneven surfaces it is recommended that you bring your own wheelchair. There is a lift to the State Apartments. 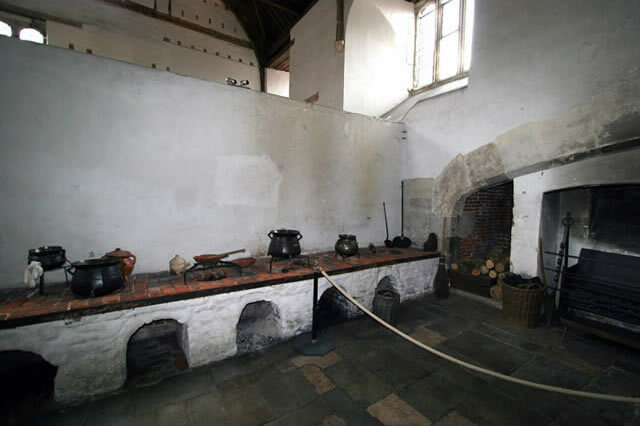 General audio tours for visitors with partial sight are available for: William III's Apartments, Tudor Kitchens, The Young Henry VIII exhibition. Braille guidebooks are available free, on loan, from the Information Centre off Base Court. Braille and large print folders are available in the Young Henry VIII exhibition.The artefacts in the Tudor Kitchens may be handled as they are replicas. Hampton Court Palace offers an escorted description service to take blind or partially sighted visitors around the palace. Transport: Hampton Court (SouthWest Trains from Waterloo). Bus routes from Kingston: 111*, 216*, 411*, 461, 513. From Richmond: R68 (routes marked * accept Oyster and Freedom Passes. Opening Times, Winter: Daily 10:00 to 16:30. Opening Times, Summer: Daily 10:00 to 18:00.